Sully, former President George H.W. Bush’s faithful service dog, will remain with his family at least through funeral services at the National Cathedral on Wednesday, according to a director at the non-profit that matched Sully with the former president. 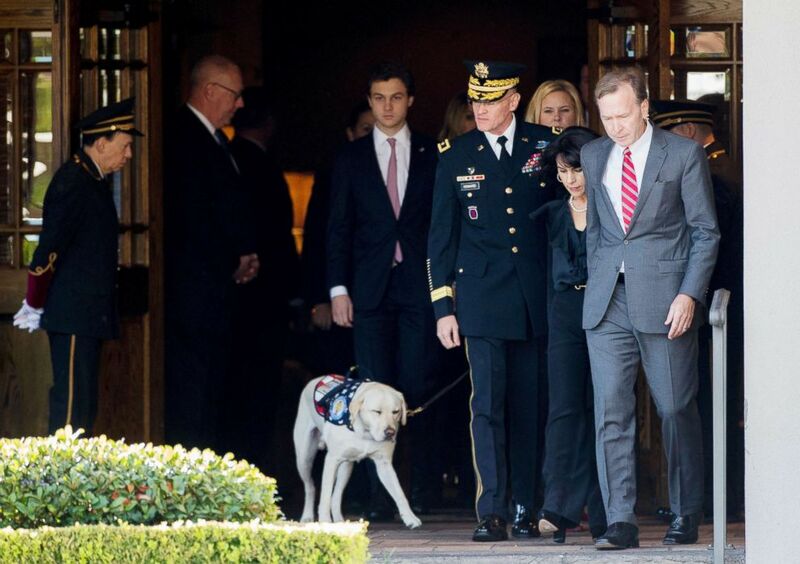 Thanks to the Americans With Disabilities Act, which was signed into law in 1990 by none other than the former president, Sully could even attend the services inside the cathedral if the family so chooses, said Andrew Rubenstein, director of marketing with America’s VetDogs. The non-profit, which pairs service dogs with veterans and first responders, matched Sully with Bush in June. The 2-year-old yellow lab was at the family’s side throughout the ceremonies on Monday. In photos released by Bush’s office, Sully sat quietly with the family as they looked over the casket at a funeral chapel in Houston. Sully also attended the president’s departure ceremony at Ellington Field Joint Reserve Base in Houston and boarded “Special Air Mission 41,” the name given to Air Force One while its purpose is to take the late president and his family to Washington and back. It remains to be seen if Sully will also return to Texas with the Bush family, Rubenstein said, as plans have been difficult to arrange in the midst of the funeral arrangements. A photo of Sully lying forlornly next to the president’s casket at a Houston funeral home first went viral on Sunday, adding to his already large following on social media stemming from the past few months helping Bush as his health continued to fail. “Mission complete,” Jim McGrath, spokesperson for the Bush family, captioned the photo on Sunday, which he posted on Twitter.